Boston Painting Contractors offers New England homeowners and local business owners a better value for their painting service needs. We provide a full range of painting services for both interior and exterior, in residential and commercial properties. Our Boston painters use top quality professional grade paints and tools, and provide our customers with a great experience from start to finish. That’s why we continue to be among the best local painting companies you can hire in Massachusetts. Managed by Stanley Painting established 1984, we stand out from the rest by taking pride in our quality of work. We provide our customers with plenty of information, and are able to eliminate unnecessary mixups by focusing on great communication from the start! We will go over your goals, and give you a great idea of what the finished results will look like as well. For the best in-home painting services in the greater Boston area, call us first! You can make us your go-to professional house painter to hire, and the results will speak for themselves. If you are struggling to find reasonable painters who do more than the bare minimum when painting your house or commercial spaces, schedule us and save more on a better quality finish! When you choose our company as your home painting contractor, you are choosing the team that does more for less on every job. The best house painting result comes from using better quality paints and materials, and having a team made up of skilled local painting contractors with the experience you can depend on. Our professional house painters get the finished look you desire for your space, and can do so on multiple types of surfaces. If you live in or around Boston looking up "best painting contractors near me", you've found us! Hire local painters and get superior quality because of the care and pride we take in our local projects. From custom painting needs to total interior coverage, we can paint any surface you need painted or touched up inside your home. A beautifully applied coat of paint can transform any home inside and out, sometimes this might be all you need to improve the look of your house! Whether you are trying to find soft earthy neutral tones for a home office or a fun, bright or whacky color for a kid’s playroom, we can help you find the right solution for your preferred style. The Best Result comes from the Best Prep! At Boston Painting, our professional painters take the necessary precautions to correctly prep any areas to be painted. 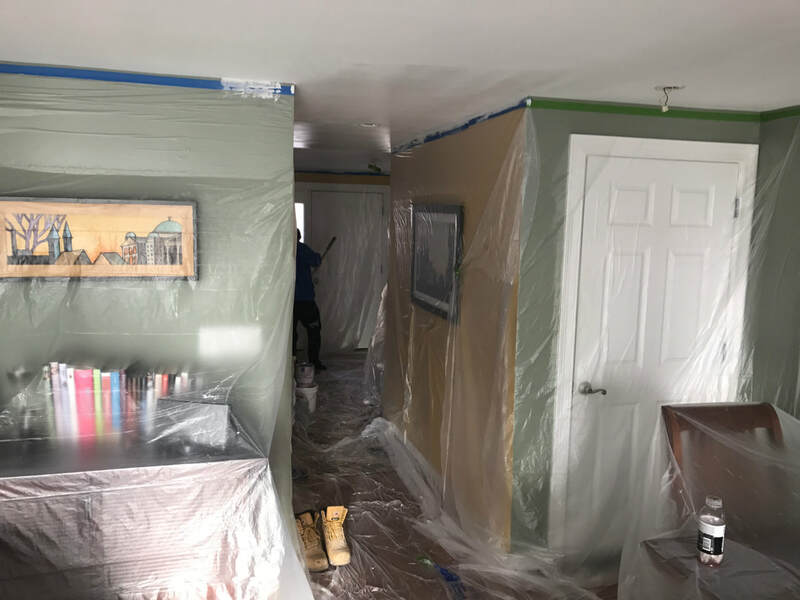 Although generally, the prepping phase takes the longest it is because we take the extra care not to damage your belongs or leave paint behind where it should not be. Because we use a better quality of primer and paint, we can achieve a flawless and more even finish without using as much as low-quality paints require. Our team also has the experience you can rely on for receiving the best professional advice possible. We will take every step to properly examine the project, and consult you on the correct steps needed for the best results. For instance, if your surfaces already have a particular type of finish, it may need to be completely sanded down first. Simply painting over could cause the fresh paint to peel away in less than a year. Rather than risk having to repaint your home again in just a few months’ time, take a moment to call Boston Painting first and have it done the right way. What is one of the best ways to add value to your home? Try a fresh coat of paint! Selling your home? Many times homeowners are under the impression that they have to spend a small fortune to replace major elements of their house to create a drastic difference in the appearance of their home. However, many realtors will tell you a professional interior and/or exterior painting job is not only more affordable; it gets the visual results that you need to transform the look and update style! My project was a big one, lots of patching needed and many layers of paint. But these guys did a fantastic job and the place looks like new! They kept a clean work site and finished up nicely. Great job! Took me some time to narrow down the right painting contractor, but I'm so glad I went with Joe and his team, From start to finish things went smoothly with my exterior painting project. Highly recommended! I would highly recommend Boston Painting services, Joe and his guys did an excellent detailed job painting my old colonial home. All the trim work came out perfect and I couldn't be happier with the process and finished product. Need help with color choices? Call us for a free consultation! Add an appealing splash of color to your living space! Boston Painting Contractors has you covered! Finding an exterior painting service around Boston has another caveat that other areas may not have; extreme cold temperatures. We are all too familiar with how cold our winters here can be, so cold in fact that paint can freeze before it sets. When that happens, it can turn into a blob that slides right off! Because of the seasonal window to offer exterior home painting services, some companies simply don’t offer it at all. ​Luckily our team never shies away from a job. If we cannot provide exterior painting at the moment due to the season and weather, we will always book a date to schedule you for when exterior painting is best, and when the weather cooperates. In fact, booking us ahead of time for the warmer months helps ensure that we have time saved just for you, and we can offer our best services to you for the job. As a professional painting contractor team, managed by Stanley Painting, we are able to purchase top quality paint brands at a significantly discounted price. When we can save more, we can quote you a lower price in the process. And when you receive a better quality of paint for less, you'll go with us every time! Our crew has all of the tools and equipment necessary for the best finish possible. We utilize a variety of different sized painting brushes, hand brushes, paint rollers, paint sprayers, and more. This way we can achieve that crisp look, with the style and personality that you want at a fair price. When your painting company does not have to rely on expensive equipment rentals, we can save you more on the cost of your project. Our Boston painting contractors are equipped to handle the biggest commercial and industrial jobs, whether it's a brand new development, office buildings, or restaurants, we are able to to any job exterior or interior. Give us a call today and we can give you a great competitive price quote for your commercial painting project, satisfaction guaranteed! Whether you’re a new homeowner or have seen the exterior of your house decline slowly over the years, there is a special draw to a freshly painted house. Yes, painting your house’s exterior can change your home. It can even be a drastic change if you plan your colors correctly! This can be a go-to if you’re trying to make a big difference without remodeling a whole room or adding on to the house. However that doesn’t mean that every house is a quick, easy or inexpensive job. We’re here to help you find out how to get your house painted and all the decisions in between! Let’s talk about what the real benefits of painting the exterior of your home are. It looks visually nice but if you’re planning on selling, showing or upgrading it goes beyond the visual appeal. A more budget-friendly home upgrade when compared to many popular home renovations. That is a pretty great list isn’t it? This list all adds up to one thing which is very important every homeowner, whether they plan on living there forever or not: resale value. You can plan on selling your home within the next year or holding onto it until time stops, but the value of your home is important. This is an investment that you worked hard for, and as expected it should continue to increase in value as an asset. But! Your work as a homeowner didn’t stop after you signed the paper and picked up the keys. The work only just begun at that point, but a major increase in value can be obtained just by painting your house’s exterior. From the list above, every single one of those benefits is part of building your home’s value. Maybe you want to continue living in your home, and don’t have any intention of selling any time soon. That’s great because you’ll still get that burst of pride when you pull into the driveway of a freshly painted house. How can you use color choices to make your home seem fresher, and more inviting? We have the breakdown to help your decision making! While there isn’t one color that will mean a great increase in resale value that you can love too there are some tried and true schemes. Grey/Beige – the perfect combination of neutrals is a popular choice. Why? Well, it doesn’t fade as noticeably as other neutrals, and doesn’t show dirt or rain patterns the way white, cream, or more orange-y hues do. Oatmeal – the adorable little sister of cream, oatmeal is not only more appealing to the eye because it isn’t as harsh but is also an inviting warm tone. Yellows, Oranges, and Purples – should be reserved for special forms of architecture. An old style Victorian or Spanish style home isn’t suited for muted neutrals. You have a lot of room to have fun with these traditionally, non-traditional homes. This is one area where a professional painter can come in handy! The trim is important, and can act as an accent, or a bold statement. Typically a few shades darker can give your house a more distinct shape; while a few shades lighter can play up some colors. Who has forgotten the bright red front door on Elm Street? We don’t want your neighbors, friends or potential buyers to think of a nightmare when they’re walking up to your house! Consult with your painting contractor or local painting company on what works with your exterior paint color. You want something inviting, like a warm blue or a cool charcoal. Painting seems easy right? Although we might have all tried our hands at a bedroom, the exterior of a house is different because of one primary reason: materials. Both the home’s exterior material and the exterior paint! Aside from the materials, it is easy for the simple task of oh… painting your house… to quickly become overwhelming. Then the job is rushed and the end result just isn’t what you wanted. Hopefully you’ll never experience this and you’ll hire a professional, exterior painting service from the start. Call a local painting company for a quote. Most often you won’t be shelling out more than a thousand or so, depending on your house size and the exterior material. A lot of people experience the pitfall of spending to paint the house twice. A lot of DIY-ers are ambitious and some are even determined to love the result of their labor. But usually a few months goes by and the small mistakes, patchy painting or outright painting mishaps become eyesores. Instead of increasing the value of your home, it’s been decreased! Hiring a professional painter or painting contractor can end up saving you money. Rather than doing it yourself and then paying a professional, have the job done by a pro the first time! So how do you go about finding a great contractor or professional painter? House painting is one of those jobs that many people claim to be wonderful at, and that isn’t always the case. They inform you that house painting takes a lot of prep work too! If someone shows up and just gets right to painting, something is wrong! Ask how they handle touchups and whether there is a time frame involved. With a professional painting service, this renovation can be painless and require minimum effort on your part. Take the chance and call our local painting company to see if your home upgrade is something that you can do not just for visual appeal but for the physical improvement of your home as well! Boston Painting contractors are proud to service Greater Boston. See our list below of the neighborhoods we service. Allston, Auburndale, Back Bay, Beacon Hill, Belmont, Brighton, Brookline, Cambridge, Charlestown, Chestnut Hill, Davis Square, Dorchester, East Boston, East Cambridge, Everett, Harvard Square, Hyde Park, Jamaica Plain, Malden, Medford, Milton, Natick, Needham, Newton Center, Newton Highlands, Newton Upper Falls, Nonantum, North End, Somerville, South Boston, South End, The Seaport District, Waban, Waltham, Watertown, West Newton, West Roxbury and many more.